Taking Suo motu cognizance, a Division bench of High Court of Kerala, comprising of Acting Chief Justice Thottathil B Radhakrishnan and Justice Anu Sivaraman directed the Police machinery and Government of the State to impose the following restrictions in view of incidents happened in last few days between Media persons and Lawyers. 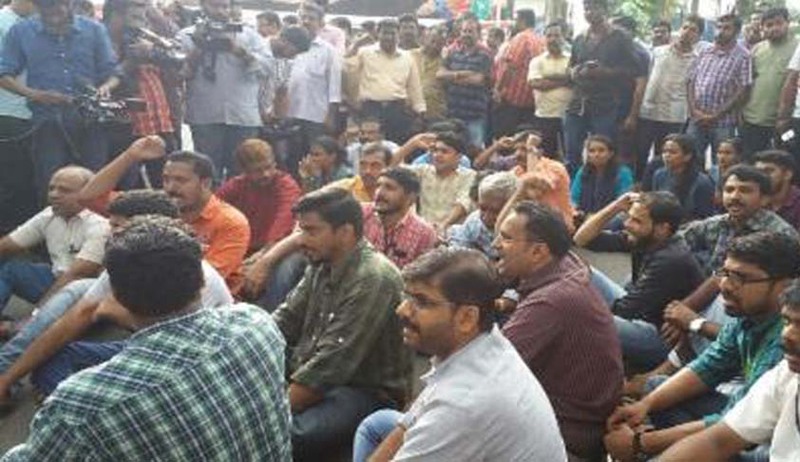 (i) The Government of Kerala , State Police Chief and Police Officers under his command shall ensure that there is no assembly or demonstration or collective expression of opinion in the court premises and also in the roads and streets around them. (iii) These restrictions shall be operated as regards all roads which surround the buildings of the High Court of Kerala as noted above and also all roads leading to a distance of 200 meters from the roads that encircle the High Court buildings. The court stated that High Court of Kerala ,and buildings under its judicial control is one such institution where there should be fearless access to people. The same shall hence be free from unlawful intrusion or brow beating , by any individual or groups; whether organized or not , the court added. The court nodded in approval in the usage of police power to ensure such protective measures from time to time. The Registrar General, Mr Ashok Menon has also been directed to take steps to publish the gist of the order in at least two English newspapers and vernacular dailies six in number, having circulation throughout the state of Kerala. The publication expenses would be borne from state funds , without depending on funds allotted for requirements of state judiciary, the order stated.